Have to agree with us been the softest side on the comp. We deserve that label. mentally soft and fragile as a team. How many on here just know we will lose to another ordinary side again. One thing I can say about North is they always give there all even if there shithouse. Time to prove me wrong. The All-Australian is a chance to make his long-awaited return against arch rivals North Melbourne. We’re playing Coll, Carl or Haw? Ahh yes - that history of about 4 years or so. I wouldn’t play Daniher at all this week. Play him fresh on Anzac day replacing Clarke. Haha. It’s such a sad thing that we’re Norths arch rivals and they don’t even register top 5 for us. The runt club cutting the price of a limited number of GA tickets for Friday. You know when you a playing an arch rival and most of the discussion leading up to the match has been about match ups for the Collingwood game. Yeah, nah, not a rivalry at all. 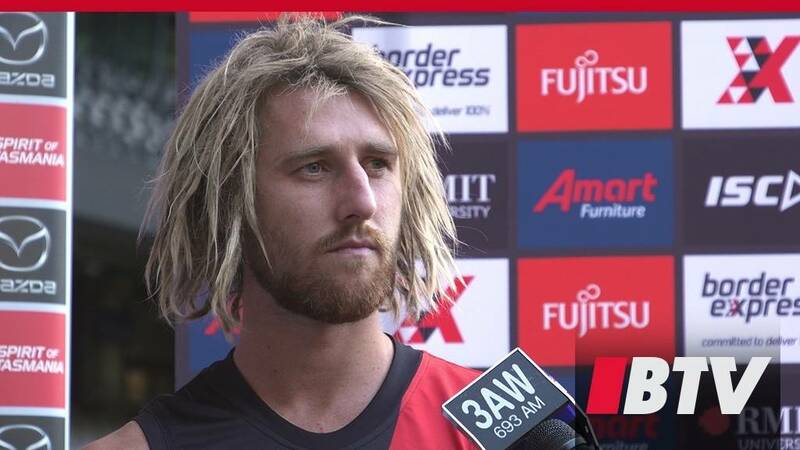 Dyson Heppell and Jack Ziebell spoke to the media in the lead up to our round five Good Friday match. Sad thing is all our rivals have had the way with us lately. Geelong I’ve put in as country game but probably not traditional huge rivals. I was always of the thought that we bring JD straight in last year and this. That’s changed. Taking into account missing most of last year, his performance prior to the injury being declared and his performance in the two JLT I would play him for 3/4’s in the twos. If we play as we have in the last two there is no way I would change the team for Anzac Day and play Joe. If we play poorly and Joe gets through I’d consider him. A call to be made on Ridley but with Francis waiting an opportunity, either way is ok.
We might think of them as irrelevant but they have quite a good record against us over the last 10 years. Maybe we should respect that miserable, tin shaking, chip on shoulder, all shinbone-no brain pissant club slightly more. Just wait for the boos the first time Brown comes flying out of a marking contest like some out of control whirling dervish. Won’t be easy this game. I dislike B Scott but I reckon he’s a really good coach and has never had a great list. He’s like Boris or Hayden Ballantyne. Hate them if they’re not yours and love them if they are. If we are concerned with playing Daniher. Then I think we still play him, but keep Clarke in as well. Draper gets clarke to give hima chop out int he ruck. Can rotate Draper/Clarke/Daniher a bit through the bench as well. If Ridley is injured Fancis comes in. Maybe we should respect that miserable, tin shaking, chip on shoulder, all shinbone-no brain pissant club slightly more. This made me laugh so much. Probably the most disrespectful comment i’ve read all week. My guess with Belly is fitness. He had a very minimal pre-season. I’d persist with him. That’s not a popular view around here though. Players should not need a rest in round 5 fcs. I agree although this is a different scenario. He’s played poorly and doesn’t look right. We also back up quickly after the weekend. ATM he doesn’t look right after 8 days so 5 days won’t work. (Rest) can read inj or dropped or whatever, doesn’t matter as long as he doesn’t play Fri and the following Thurs. Of all spots on the ground you must be able to compete and get to contests as a ruckman. He looks to be struggling. If he has sore calves, a rest would do him good. Freshen him up for Grundy next week. I’d love to debut Draper. And gives a chance for us to see Draper and Clarke up forward, and whether we can play 2 rucks plus Daniher. It may stretch Collingwoods Backline.